Congratulations to the winners of the Affiliate Competition for Week 3! This week’s prizes went out to the top 16 spots because of ties. 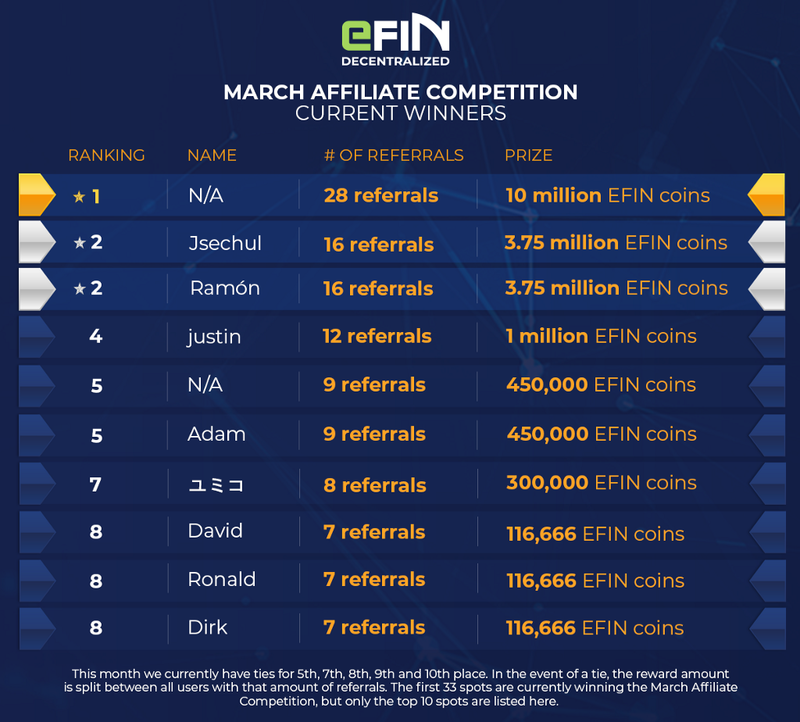 Our affiliates are racking up massive amounts of EFIN coins and there are just a few days left of the March Competition. You still have a few more days to claim your share of the prizes being giving away this month! 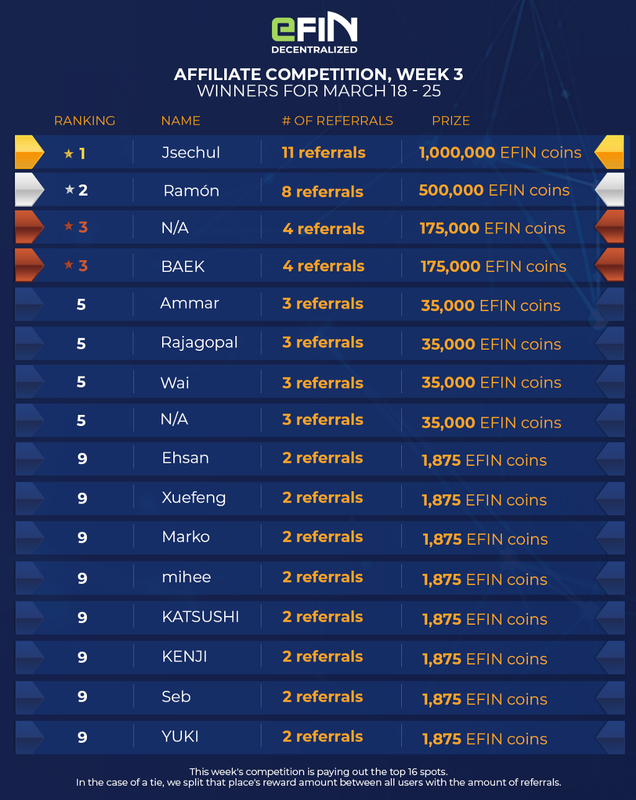 As of a few hours ago, this is the current list of winners for the Affiliate Competition for March. We’re paying out huge amounts of EFIN coins to over 30 winners right now. You still have a few days left to share your affiliate link and claim your share of the prizes. Just a few short days remain before EFIN is released on the Mainnet and the enhanced TPAY staking rewards begin. You MUST be a Partner or Platinum Partner to take full advantage of these rewards and receive the max EFIN coins possible. Once Mainnet launches in just a few days, the price of a Partnership i to € 495. Upgrade now for just €295 and you’ll get a massive staking multiplier (5X for Partners and 10X for Platinum Partners), bonus EFIN coins (100,000 for Partners and 1 million for Platinum Partners), unlimited free trading, free Airdrops of newly listed tokens (like the upcoming CBET token) and a 100% referral bonus. Secure your spot now! Week 3 Affiliate Competition Winners was originally published in TokenPay on Medium, where people are continuing the conversation by highlighting and responding to this story.